A King’s School Bibliography (1999) lists books about the School, both fact and fiction, as well as the published works of over 400 OKS authors. Since 1999, over two hundred more authors have been added in a supplement. There have been several histories of the School published. The first, Memorials of the King’s School, Canterbury by J.S. Sidebotham, appeared in 1865. Schola Regia Cantuariensis: A History of Canterbury School, commonly called the King’s School, by C.E. Woodruff and H.J. Cape (1908) is the fullest and best documented account. 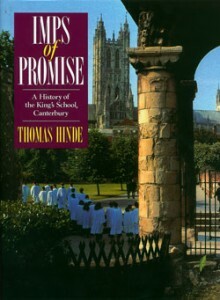 A History of the King’s School Canterbury by David Edwards brought the story up to 1957. Imps of Promise by Thomas Hinde, published in 1990, is the most recent history and the best illustrated. An updated edition appeared in 2005. The School features in autobiographies and works of fiction by some former pupils. See: Memories of King’s. The Hugh Walpole Collection contains an outstanding selection of English literary manuscripts and fine books.